Hi I am new the Fourm, I just recently acquired a 1998 Honda Accord EXL 5 speed manual Trans. only 157k on the mileage, Idles and runs great, so far only basic cleaning and maintenance has been needed. but now that's it raining here in Oregon, I went to use the windshield wipers and.... nothing. it only works if I pull down to use the quick wipe, the washer function works as well. I first checked the relay.... it was missing, so after spending 50$ on a relay I figured it would solve the problem, nope, still the same functions as before. any ideas? upon tearing the steering column apart I found the problem. just in case this can help someone elese haveing this problem. 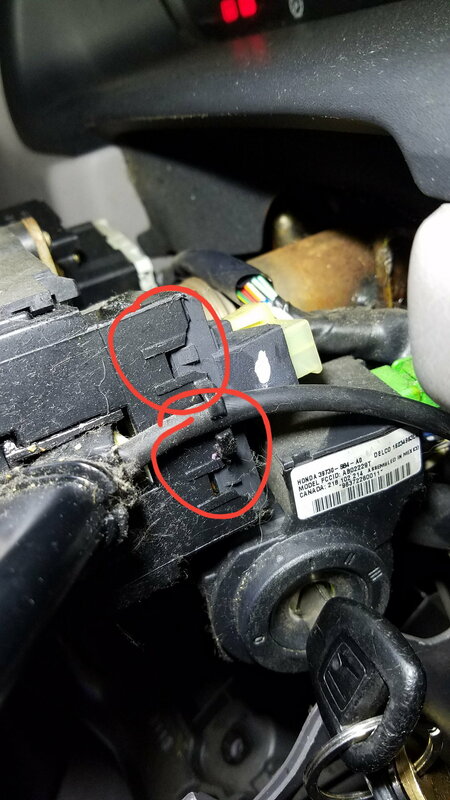 So it looks like the keeper tabs have been broken off and the connector had worked itself loose. Is that what you're saying? yes exactly. im glad I went ahead and tore the column apart before buying a new switch. sorry for posing before fully diving into the problem.